Deck provided with 60 Ø 4-mm safety sockets. Set of 4 staples for use with the universal deck ref PEM 015 600. Quadrupole staple for use with universal deck, ref PEM015600. 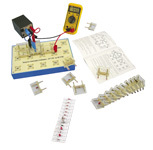 Includes 13 components for the study of DC settings. The deck should be ordered in addition. Includes 13 components for the study of AC settings.